What to read ? This part of the website will be both easy and difficult to feed . Easy because there is plenty of material , difficult because there is a great deal of dross . This is not the expression of an academic who thinks all books except his own are bad . It is the fact that since less and less is known about Africa , in terms of general knowledge , the criteria for book selection tends to veer strongly on the side of what will sell . To give a simple example before 1994 there was very little published material on Rwanda . After the genocide there was a huge amount . And today the volume of the production has considerably slowed down because nothing sensational or shocking is coming out of there at the level of general press information . In addition there is the sheer volume of the non-book literature : reports from the UN , from the NGOs , from various Think Tanks . They make up a very uneven lot . Therefore this section will be tentative . I will draw attention to productions I judge worthwhile and I hope to be right . But I am unlikely to be exhaustive . Please dear readers , submit your entries . Publishers too , although I cannot guarantee that a submission will automatically draw a praise review in response . I am notoriously strong-headed and frank , verging on cantankerous . On the other hand , I do not withhold my praises from what I judge really good . Finally a word about movies : “Out of Africa” is not really my cup of tea . But if you look at Benda Bilili by Renaud Barret and Florent de la Tullaye , Viva Riva by Djo Tunda wa Munga , Kinshasa Kids by Henri Wajnberg or Katanga Business by Thierry Michel (sorry folks , I am on a Congo trip just right now !) , then you have really seen something and you have learned more about the Congo than by reading many books . The whole Usalama Project , five or six little booklets published by the Rift Valley Institute on Eastern Congo . 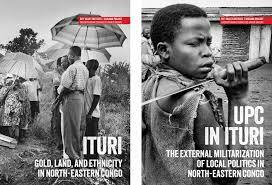 I have read only the first two (Ituri : Land , Gold and Ethnicity in N.E. Congo by Dan Fahey and UPC in Ituri by Henning Tamm) but if the others are as good , we are on to something good at the micro level in Eastern Congo . 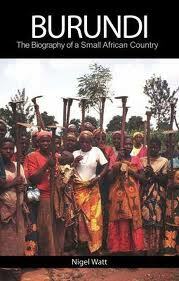 Nigel Watt : Burundi : Biography of a Small African Country London . Hurst and Co . 2008 (yes , from time to time you will find here books I did not manage to read as well as they deserved when they first came out ) . The author is British but he knows his Burundi like the bottom of his pocket . When you know the country you get a refreshing feeling of “we are right here” . And it’s a relief . Read this book . Things are not going well at all in Burundi and it is high on my list of countries that could go wrong again . Just when we thought they were out of the woods . 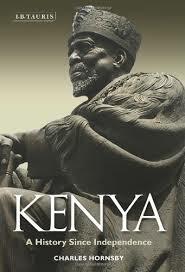 Charles Hornsby : Kenya : A History Since Independence London . I.B. Tauris . 2012 . Once in a while you find somebody who can do the unthinkable : do in one fell swoop all what has to be done on a certain topic . When I recently saw that book at Foyle’s in London , I smiled at its foreboding size (958 pages , no less !) , anticipating hack work . But I picked it up anyway . I did not think you could add to Daniel Branch’s : Kenya : Between Hope and Despair (1963-2011) published by Yale University Press in 2011 which I had bought last year in Nairobi . But I was wrong : yes you could . Look to Branch for the interpretations and to Hornsby for the – clear and wonderfully detailed – facts . Both dovetail into each other . If you know nothing about Kenya and want to learn , read both . After surviving that mass you’ll feel a better man (or woman) . Ready to interpret whatever comes out of Kenya in the probably difficult follow up after the recent elections . Stig Jarle Hansen : al-Shabaab in Somalia : the History and Ideology of a Militant Islamist Group (2005-2012) London . Hurst and Co . 2013 . This is not a book written from a distance . Stig Jarle Hansen was there , with the Shabaab . The man must be mad . Or heroic . I was in Mogadiscio a month ago and I can tell you I was nowhere near the Shebaab . The closest I came into contact with them was when they would blow up something or other in the city . I considered myself lucky to be some distance away from the place where the unpleasantness was happening . But Hansen was there , with them , on the spot ( I do not think he put any bombs himself) . This is a tremendously devoid-of-pathos-and-heroics first hand account that you cannot find elsewhere . A journalist who is an anthropologist at the same time is worth reading . 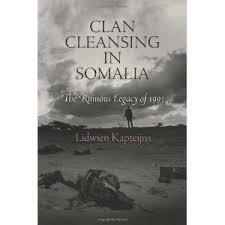 Lidwien Kapteijns : Clan Cleansing in Somalia : The Ruinous Legacy of 1991 . Philadelphia . The University of Pennsylvania Press . 2013 . This is an absolutely vital book if you want to understand the Somalia mess (until mine comes out , of course !) . Professor Kapteijns has done an enormous amount of research among survivors and eyewitnesses to clarify what happened at the time of the fall of Siad Barre . Not what happened later . Just in January 1991 , when the Somali world went unhinged and plunged into a civil war which has not ended twenty-two years later . There were many causes ; then there was a (horrible) process ; and then later came the unending aftermath . This was not simple anarchy . Professor Kapteijns unravels the various strands of causality , analyzes the politics and shows the results . This is a “how a civil war is born” book . A must reading if you are interested in the causes of the Somalia tragedy .